Like bowties and time travel? 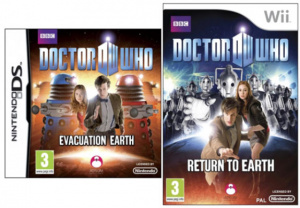 Then you should be excited to hear that the hit BBC programme Doctor Who is zooming to the DS and Wii with Doctor Who: Evacuation Earth for the former and Doctor Who: Return to Earth for the latter, both set for release in the coming months from Asylum Entertainment. The program stars The Doctor, a 907 year old Time Lord who, with his companion, winds up in different spots of trouble across time and space in a ship that resembles a 1950s style police box. Every so often he regenerates, his old body transforming into a new one; the two games will star the eleventh Doctor, played by Matt Smith. We don't know much more than what we can glean from the cover art – in other words, he'll face Cybermen on the Wii and Daleks on the DS. The bad news? There are no plans for a release outside of the U.K., other parts of Europe and Australia. American fans, we're sorry... we're so, so sorry. I've never sought out off-region games, but I will play these. OMFG. I can't bloody believe it. I am a HUGE Who fan (Whovian) and I cannot wait to fly around in the Tardis. )) Who's with me? K9? Adric? @Swerd_Murd It stands for "Time And Relative Dimension(s) In Space". You can read about it here! Holy Cow I just had a Nerdgasm. Even if these are the worst games ever I wil buy both of em. What no Sontarans? so happy, i was hoping they would make games for consoles, and it seems they have a special deal with Nintendo. The downloadable games apparently did very well. so yeah, looks like that sent a good message out that people are interested. Anyone that hasn't played those games, please do, they're quite cheap for non-UK residents, and fun and quirky. I dislike Doctor Who a great deal. Are those collections of the PC adventures of earlier this year? As far as I can tell from the covers, they're new games. The downloadable games from the BBC site are solid, well put together efforts with some rather fiddly(at times) controls and some cunning(ish) puzzles, they kind of play like a point-and-click Prof Layton with stealth sections and are surprisingly playable. If these games build on that, they could be half decent. Looks like a good one to flag as a Christmas pressie. Hasn't this been in development since late last year/early this year? Huge fan of Dr Who. Cannot wait. Please be good. This game better be good. Doctor Who is cool and so are fezes and bow ties. I wonder if these will be good games, hopefully they will be. Even if they are, despite being a big Doctor who fan, I won't get this straight away since there are so many great games coming out and there are still a lot that are out now that I need. They should give free bow ties out with the games. Bow ties are cools. As are fezs. No release outside of the UK? C'mon! There are A LOT of HUGE Dr. Who fans on this side of the pond! I may have to import the DS version! James...seriously? You dislike Dr. Who a great deal? Let's just hope it's not more shovelware in the Crappy Lisenced Game pile. october 29th i read on some obscure website. Lame, it stars Matt Smith. Pass pass pass. Well, I can always buy one on eBay. @nintenzo The wii is region-locked and the wii freeloader doesn't work any more. @Prosody What is it that you dislike most about Doctor Who, the witty dialogue, compelling stories, great acting, exciting action or heart-wrenching drama? Doctor Who is awesome but I have a feeling the games will be like any TV/movie themed game. It isn't even going to be outside of the UK anyways. Well... sweet for you U.K. people. I like Dr. Who. I'm not sure I would pick these up even if it does come to NA because licensed games aren't usually good. The cover art makes it look like one of those games. Concerned about who's developing it - have Asylum Entertainment ever made anything good? I had a look, couldn't find much outside of licensed shovelware. @ LEGEND MAROID: They should give free bow ties out with the games. Bow ties are cools. As are fezs. I agree, dude. I agree. 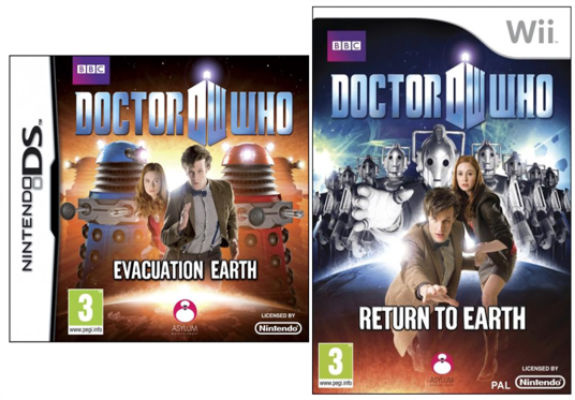 Screw this, where is my Sarah Jane Adventures game? If the games do turn out to be good, maybe someone will acquire the rights to release the games elsewhere. I'll definitely have to keep an eye on this. I love Doctor Who. Why can't this hit the States? omigosh I must have these games cuz I'm the biggest DW fan ever! BUT stupid Asylum Entertainment wont sell it in the US! grr I'll have to play the europpe version. A good Doctor Who game would be wonderful, but this isn't going to be it -- as others have pointed out, Asylum Entertainment ain't exactly Rockstar North. 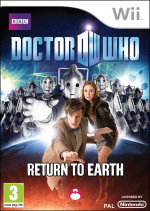 I don't think Stateside Doctor Who fans will really regret missing out on this one. I used to be soooo obsessed with Doctor Who, but this game is probably not gonna be great. It'll be a point 'n' click game, I reckon, with a 1-hour story and no extras. Prove me wrong, Asylum Entertainment.